A bald eagle takes flight in Newcastle, March 21, 2015. The Maine Warden Service is offering a reward for any information leading to the conviction of whomever shot a bald eagle in Waterford. The Maine Warden Service is offering a $1,000 reward for anyone who has information about a bald eagle shooting in Waterford. Game wardens responded on Dec. 26 to reports of a bald eagle acting abnormally near Papoose Pond, according to Cpl. John MacDonald, spokesman for the Maine Warden Service. The eagle eluded game wardens attempting to capture it for evaluation even though it could only fly for short distances, MacDonald said. Game wardens returned to the area a few days later and captured the eagle, which was by then in a weakened condition and less mobile, MacDonald said. The eagle was transported to Avian Haven, a wild bird rehabilitation center in Freedom. X-rays showed the eagle had been shot and had six shotgun pellets lodged in its jaw, wings and leg, MacDonald said. The eagle died on Dec. 30, likely as a result of starvation, according to MacDonald. MacDonald said Maine Operation Game Thief is offering up to $1,000 for information leading to the conviction of whomever shot the eagle. Anyone with information related to the shooting can call Maine Operation Game Thief at 1-800-ALERT-US (1-800-253-7887) or public safety dispatch in Augusta at (207) 624-7076. Callers can remain anonymous via the Operation Game Thief call line. Maine’s eagle population is in healthy shape with 734 nesting pairs in 2019, MacDonald said. That’s up from a low of 21 nesting pairs in 1967. 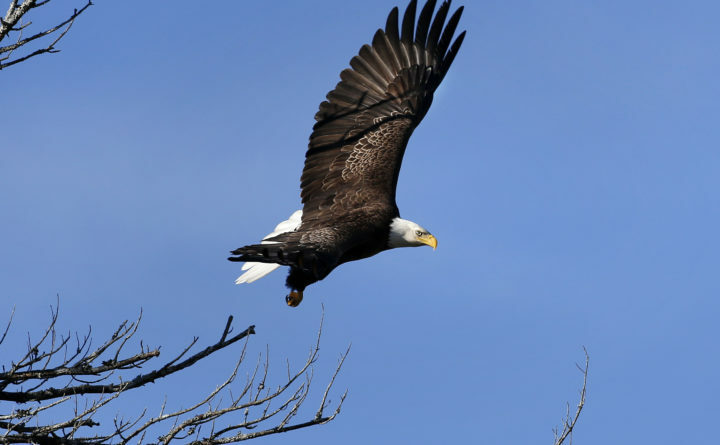 A recent survey documented eagle increases in all Maine counties since the last statewide survey five years ago, MacDonald said.